CCH’s State Network, active in 11 suburbs and downstate communities, is launching a State Organizing Committee to steer its work in Illinois. 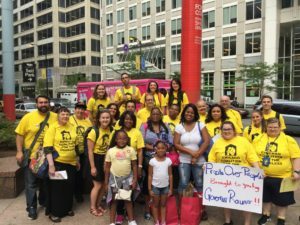 Active for five years, the coalition’s statewide organizing network mobilizes more than 1,700 people a year on issues that impact homeless families, youth and adults in Illinois. Organizer Jim Picchetti (far left) with leaders from Aurora, Bolingbrook, Chicago, Romeoville and Waukegan at a downtown protest over the lack of a state budget. Staffed by Jim Picchetti, a senior community organizer at CCH, the new steering group will connect providers and churches from different parts of Illinois to share how homelessness is uniquely impacting their communities. They will also identify laws or practices that harm homeless and at-risk families in their community, and develop strategies that make addressing homelessness a priority in Springfield. This work is critical, as Illinois struggles without a state budget and we face a conservative national platform on housing and poverty issues under the incoming Trump administration. Among its 2016 efforts, the State Network co-founded the DuPage County Homeless Alliance. The group persuaded Naperville’s City Council to vote 5-4 in October for an ordinance that bars landlords from discriminating against tenants assisted by government vouchers. The group’s first quarterly meeting will be January 12. Staff and homeless leaders represent committee members, which include Hesed House, Aurora; Housing Forward, Maywood and Oak Park; Love Fellowship Baptist Church, Romeoville; PADS Lake County, Waukegan, and Shelter Care Ministries, Rockford.